The Magnuson-Stevens Fishery Conservation and Management Act (Magnuson-Stevens Act), as amended by the Sustainable Fisheries Act of 1996, established procedures to require federal agencies to identify, conserve, and enhance Essential Fish Habitat (EFH) for species regulated under a Fisheries Management Plan (FMP). Under the Magnuson-Stevens Act, federal agencies must consult with the National Oceanic and Atmospheric Administration’s National Marine Fisheries Service (NOAA Fisheries), also known as the National Marine Fisheries Service (NMFS), on all “federal actions” including, all actions proposed, authorized, funded, or undertaken, that may adversely affect EFH (16 U.S.C. § 1855). NOAA Fisheries is the federal agency responsible for the management, conservation, and protection of the Nation’s marine and anadromous species. Anadromous species are those species of fish which spawn in fresh or estuarine waters and migrate to ocean waters. Salmon and other ecologically and economically important migrating fish species, such as shad and sturgeon, need access to freshwater habitat for spawning and rearing their young. Some fish need to swim thousands of miles through oceans and rivers to reach their destination. Hydropower installations, such as dams, can adversely impact fish habitat and marine resources. NOAA Fisheries works with other federal agencies and hydropower plant developers to avoid or reduce impacts to fish and their habitat. The EFH Guidelines (50 CFR 600.05 to 600.930) outline the process for federal agencies, NOAA Fisheries, and the Fishery Management Councils to satisfy the EFH Consultation requirement under Section 305(b) of the Magnuson-Stevens Act. As part of the EFH Consultation process, the federal agencies must prepare a written EFH Assessment (EFHA) describing the effects of that action on EFH (50 CFR 600.920(e)(1)). 12-FD-i.1 – Does the Proposed Federal Action Have the Potential to Cause Substantial Adverse Effects on Essential Fish Habitat (EFH) of Marine or Anadromous Fish Species? Essential Fish Habitat (EFH) are “those waters and substrate necessary to fish for spawning, breeding, feeding or growth to maturity.” 16 USC 1802(10). Section 305(b)(2) of the Magnuson-Stevens Act requires federal agencies to consult with NOAA Fisheries on all “federal actions” including, all actions proposed, authorized, funded, or undertaken, that may adversely affect EFH (16 U.S.C. § 1855). As part of the consultation process, the federal decision-making agency (lead agency) must prepare and submit an EFH Assessment containing a written assessment of the potential effects of the proposed action on the EFH (50 CFR § 600.920(e)(1)). “Adverse effect” means “any impact that reduces quality and/or quantity of EFH.” Adverse effects may include, “direct or indirect physical, chemical, or biological alterations of the waters or substrate and loss of, or injury to, benthic organisms, prey species and their habitat, and other ecosystem components, if such modifications reduce the quality and/or quantity of EFH.” Moreover, adverse effects “may result from actions occurring within EFH or outside of EFH and may include site-specific or habitat-wide impacts, including individual, cumulative, or synergistic consequences of actions.” 50 CFR 600.805(a). A description of the EFHA preparation process begins at 12-FD-i.9 below. EFH is identified and described by Regional Fishery Management Councils as part of Fishery Management Plans (FMPs). The Magnuson-Stevens Act established eight Regional Fishery Management Councils (16 U.S.C. § 1852(a)(1)). Each Council is required to create an FMP for each fishery under its authority that requires conservation and management (16 U.S.C. § 1852(h)(1)). Among other provisions, FMPs contain EFH provisions that include a description and identification of the EFH, adverse effects on EFH, and actions to conserve and enhance EFH (50 CFR § 600.805(a)). The detailed requirements for the contents of Fishery Management Plans can be found at 50 CFR § 600.815. 12-FD-i.2 to 12-FD-i.3 – Has the Lead Agency Determined the Proposed Federal Action Will Not Adversely Affect EFH? If the lead agency determines the proposed federal action will not adversely affect EFH, then the lead agency may continue with the proposed action without preparing an EFHA or completing the EFH consultation process. 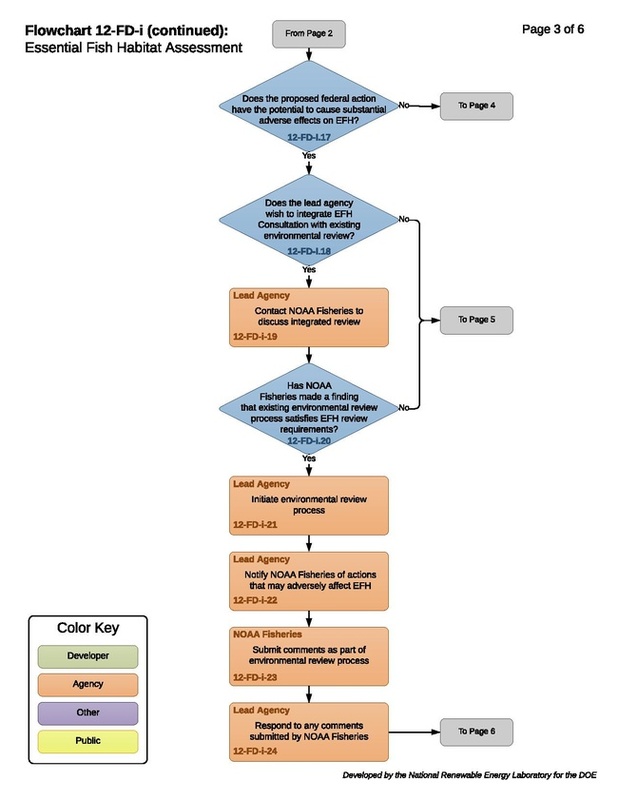 However, if NOAA Fisheries determines the federal action has the potential to adversely affect EFH, then NOAA Fisheries may request the lead agency to initiate EFH consultation. 12-FD-i.4 – Does the Federal Action Qualify for a General Concurrence (GC)? If the proposed federal action does not have the potential to cause substantial adverse effects on EFH, then the action may qualify for a General Concurrence (GC) (50 CFR § 600.920(g)). 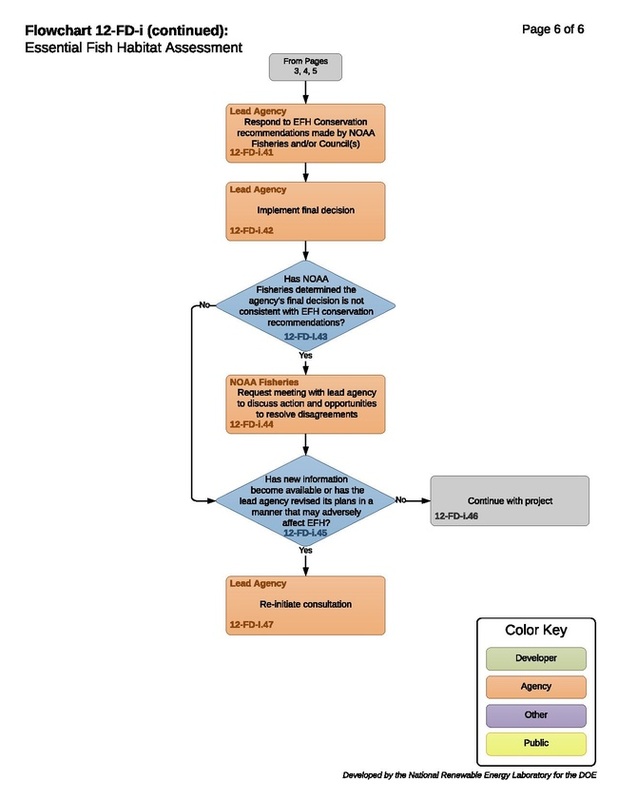 The GC process identifies specific types of federal actions “for which no further consultation is generally required because […the actions] will likely result in no more than minimal adverse effects individually and cumulatively” (50 CFR § 600.920(g)(1)). If a federal action qualifies for a GC, then the lead agency does not need to complete an EFHA (50 CFR § 600.920(e)(1)). Will not cause greater than minimal cumulative adverse effects on EFH. Actions qualifying for GC must be tracked to ensure that their cumulative effects are no more than minimal. Tracking actions covered by a GC is the responsibility of the Federal agency, but NOAA Fisheries may also agree to track these actions. 50 CFR 600.920(g)(2)(ii). In addition, categories of federal actions may also qualify for GC if they are modified by appropriate conditions that ensure the actions will meet the criteria in 50 CFR § 600.920(g)(2)(i). 12-FD-i.5 to 12-FD-i.8 – Has NOAA Fisheries Determined Actions Covered by the GC Could Result in More Than a Minimal Impact on EFH? 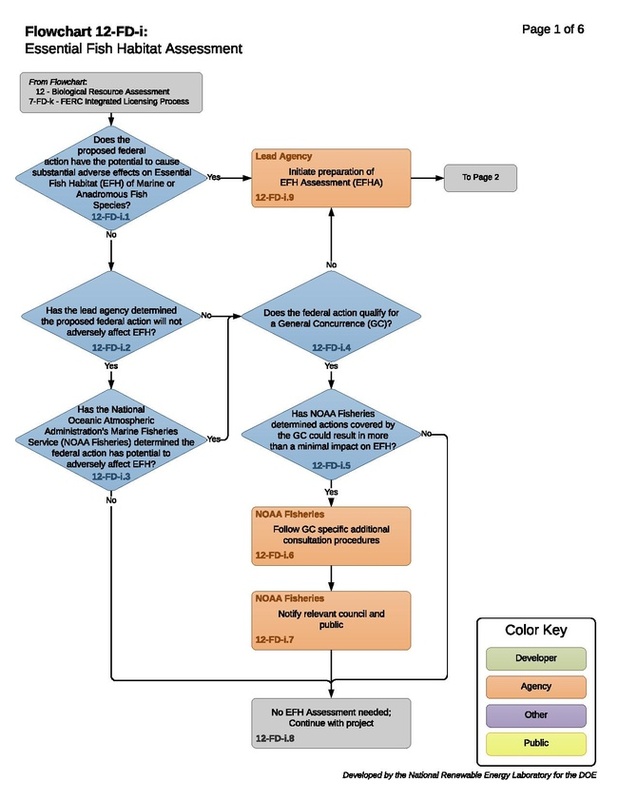 If NOAA Fisheries has determined that the category of actions covered by a particular GC could result in more than a minimal impact on EFH, or if NOAA Fisheries determines that there is no process in place to adequately assess cumulative impacts of actions covered under the GC, NOAA Fisheries may require further consultation. Further consultation under a GC will be based on specific procedures set forth in the GC. NOAA Fisheries must provide notice of its decision to the appropriate Council(s) and to the public. (50 CFR § 600.920(g)(4), (5)). If the federal action qualifies for application of a GC and no further consultation is required, then the lead agency may continue with the proposed action. 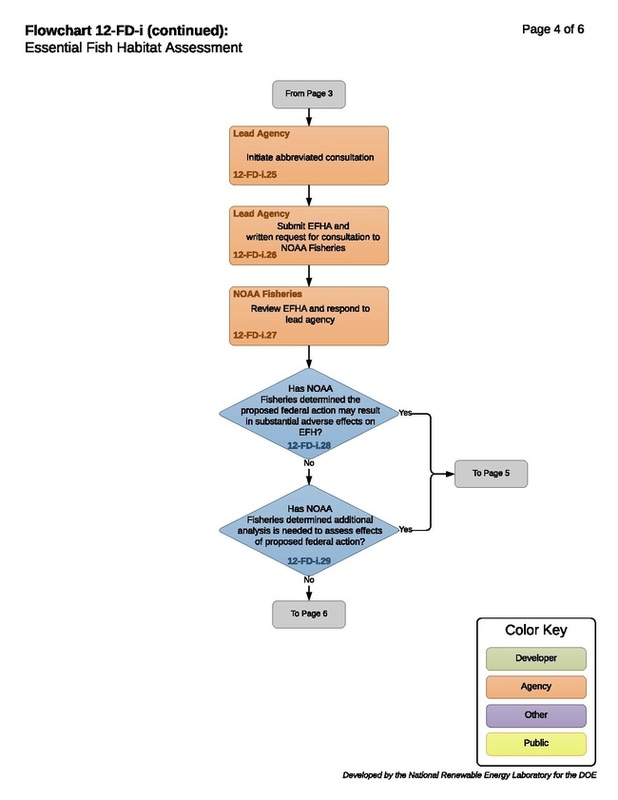 As an integral part of the interagency consultation process under the Magnuson-Stevens Act, lead agencies must prepare and submit to NOAA Fisheries an EFHA containing a written assessment of the potential effects of their proposed action(s) on EFH (50 CFR § 600.920(e)(1)). EFHA must be based on the “best scientific information available regarding the effects of the action on EFH” (50 CFR § 600.920(d)). The level of detail should be commensurate with the complexity and magnitude of the potential adverse effects of the action (50 CFR § 600.920(e)(2)). While assessments for relatively simple actions involving minor adverse effect may be brief, assessments for actions posing more serious threat to EFH should be more detailed (50 CFR § 600.920(e)(2)). EFHA may incorporate previously prepared EFHA if the proposed federal action is similar to a previous action for which the agency prepared an EFHA (50 CFR § 600.920(e)(1)). Similar actions are those that involve similar impacts, and occur in the same geographic area or similar ecological setting. The lead agency should incorporate the previous EFHA by reference and supplement it with any relevant and/or new project specific information. EFHA should indicate whether the proposed action may adversely affect Habitat Areas of Particular Concern (HAPCs). HAPCs are areas identified by an FMP as areas of particular concern within an EFH. Actions that impact HAPCs will likely receive increased scrutiny by NOAA Fisheries when developing conservation recommendations. The rarity of the habitat type. 12-FD-i.14 to 12-FD-i.15 – Is More Than One Agency Responsible for the Federal Action? If more than one federal agency is responsible for a federal action, then the consultation may be fulfilled through a lead agency. The lead agency must notify NOAA Fisheries in writing that it is representing one or more additional agencies. The lead agency must initiate consultation with NOAA Fisheries for all federal actions that have the potential to adversely affect EFHA (16 U.S.C. § 1855). In addition, consultation is required for renewals, reviews, or substantial revisions of actions if the renewal, review, or revision may adversely affect EFH (50 CFR § 600.920(a)(1)). 12-FD-i.17 - Does the Proposed Federal Action Have the Potential to Cause Substantial Adverse Effects on EFH? If the proposed federal action does not have the potential to cause substantial adverse effects on EFH and when that action does not qualify for a GC, then the lead agency will initiate the Abbreviated Consultation process, detailed beginning at 12-FD-i.25. More involved consultation processes are discussed below and include, (1) Integrated Consultation; and (2) Expanded Consultation. If the proposed federal action will not adversely affect EFH, then no consultation is needed. 12-FD-i.18 to 12-FD-i.20 – Does the Lead Agency Wish to Integrate EFH Consultation with Existing Environmental Review? Federal agencies may incorporate EFHA and EFH Consultation into existing environmental review processes such as those processes available under NEPA, the Fish and Wildlife Coordination Act, Clean Water Act, ESA, and Federal Power Act (50 CFR 600.920(f)). This practice is encouraged where it is appropriate and efficient to consolidate EFHA and EFH Consultation with existing interagency consultation, coordination, and environmental review procedures (50 CFR 600.920(f)(1)). For example, development of EFHA and EFH Consultation may be integrated with environmental review completed as part of the FERC licensing process. 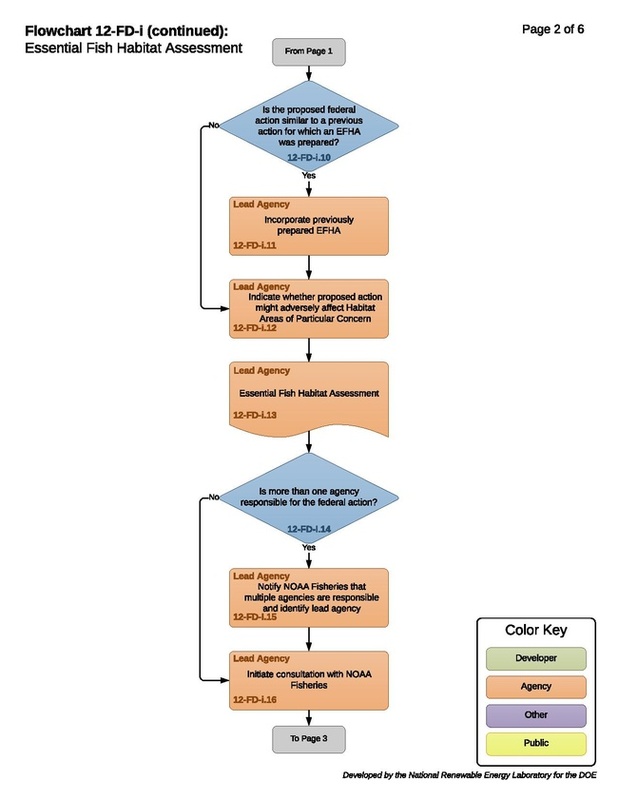 Prior to utilizing Integrated Consultation, the lead agency must contact NOAA Fisheries to discuss whether Integrated Consultation is appropriate (50 CFR 600.920(e)(3)). 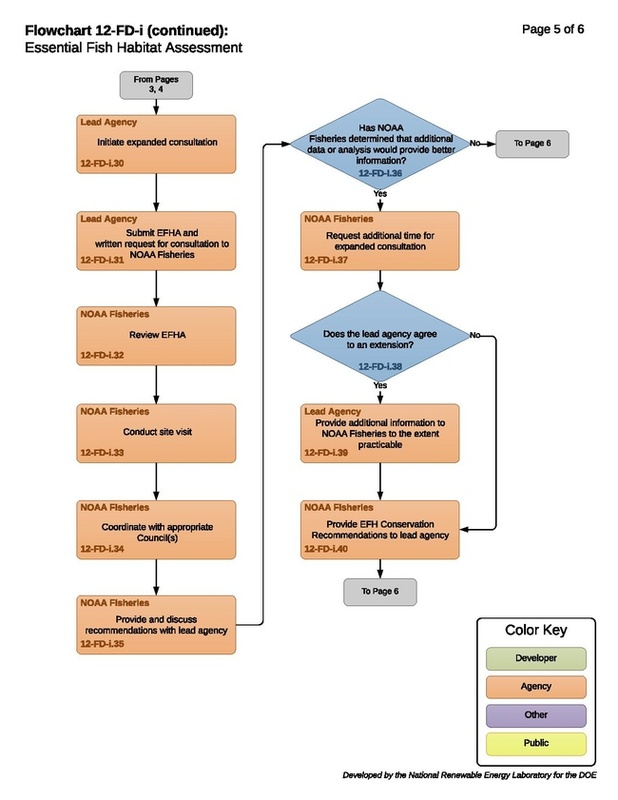 Integrated Consultation is subject to approval by NOAA Fisheries and, as such, only after NOAA Fisheries makes a finding that Integrated Consultation would meet EFH Consultation requirements should the agency initiate EFH Consultation as part of another environmental review process. (50 CFR 600.920(e)(3)). If EFHA is contained in another document, it must include all of the information required by 50 CFR 600.920(e)(3) and be clearly identified as an EFHA. Consultations should be consolidated, where appropriate, under existing environmental review procedures required by other statutes, such as NEPA, the Fish and Wildlife Coordination Act, Clean Water Act, ESA, and the Federal Power Act. As part of the existing environmental review notification process, the lead agency must provide NOAA Fisheries with timely notification of actions that may adversely affect EFH (50 CFR 600.920(e)(1)(i)). Notification must include an assessment of the impacts of the proposed action on EFH and identify the section containing the assessment (50 CFR 600.920(e)(1)(ii)). The comment deadline for the existing environmental review process should be applied (50 CFR 600.920(e)(2)). In addition, Expanded Consultation procedures must be used for analyzing all proposed actions that have the potential to result in substantial adverse effects to EFH (50 CFR 600.920(i)). Abbreviated Consultation expedites NOAA Fisheries’ determination of whether and to what degree a proposed action has the potential to adversely affect EFH. If the lead agency determines the proposed federal action might adversely affect EFH but does not have the potential to cause substantial adverse effects on EFH and does not qualify for a GC, then the agency may initiate Abbreviated Consultation (50 CFR 600.920(h)(1)). The lead agency initiates AC by submitting a completed EFHA and written request for consultation to NOAA Fisheries (50 CFR 600.920(h)(2)). The lead agency must submit its EFH Assessment to NOAA Fisheries at least 60 days prior to making a final decision on the action. (50 CFR 600.920(h)(4)). NOAA Fisheries must respond in writing within 30 days (50 CFR 600.920(h)(4)). If NOAA Fisheries determines that an action would not adversely affect EFH or that no EFH Conservation Recommendations are needed, it will notify the lead agency and the lead agency may proceed to implementing its final decision. However, if NOAA Fisheries determines that the action may result in substantial adverse effects on EFH or that additional analysis is needed to assess the effects of the action, NOAA Fisheries will request in writing that the lead agency initiate Expanded Consultation. If Expanded Consultation is determined not to be necessary, NOAA Fisheries will provide EFH Conservation Recommendations that may include measures to avoid, minimize, mitigate, or otherwise offset adverse effects on EFH resulting from actions or proposed actions authorized, funded, or undertaken by that agency. Expanded Consultation allows maximum opportunity for NOAA Fisheries and the lead agency to work together to review the proposed action’s potential impacts on EFH and to develop EFH Conservation Recommendations. If the lead agency is unable to integrate required EFH Consultation with an existing environmental review process, or if federal actions would result in substantial adverse effects to EFH, then an Expanded Consultation is needed to assess effects of the proposed federal action. Federal agencies are encouraged to contact NOAA Fisheries at the earliest opportunity to discuss whether the adverse effects of an action make expanded consultation appropriate. The lead agency submits a completed EFHA and written request for consultation to NOAA Fisheries. (50 CFR 600.920(h)(2)). The lead agency must submit its EFH Assessment to NOAA Fisheries as soon as practicable, but at least 90 days prior to making a final decision on the action. (50 CFR 600.920(i)(4)). Discussion of EFH Conservation Recommendation with lead agency. 12-FD-i.36 to 12-FD-i.39 – Has NOAA Fisheries Determined that Additional Data or Analysis Would Provide Better Information? If NOAA Fisheries determines that additional data or analysis would provide better information for development of EFH Conservation Recommendations, it may request additional time for Expanded Consultation. However, NOAA Fisheries and the lead agency must agree to an extension. If NOAA Fisheries and the lead agency agree to an extension, the lead agency should provide the additional information to the extent practicable. If NOAA Fisheries and the lead agency do not agree to extend consultation, NOAA must provide EFH Conservation Recommendations to the lead agency using the best scientific information available. Sections 305(b)(3) and (4) of the Magnuson-Stevens Act requires NOAA Fisheries (see 50 CFR 600.925) and relevant Councils (see 50 CFR 600.930) to provide comments and EFH Conservation Recommendations to the lead agency on actions that affect EFH. Recommendations may include measures to avoid, minimize, mitigate, or otherwise offset adverse effects on EFH resulting from actions or proposed actions authorized, funded, or undertaken by that agency. Section 305(b)(4)(B) of the Magnuson-Stevens Act requires that the lead agency respond in writing to comments received from NOAA Fisheries and/or relevant Council(s) as part of the EFH Consultation process. (16 U.S.C. § 1855(b)). The lead agency must respond within 30 days. The lead agency’s response must include a description of measures proposed by the agency for avoiding, mitigating, or offsetting the impact of the activity on EFH. If the agency’s response is inconsistent with NOAA Fisheries’ Conservation Recommendations, then the response must explain the agency’s reason(s) for not following the recommendations, including the scientific justification for any disagreements with NOAA Fisheries over the anticipated effects of the action and the measures needed to avoid, minimize, mitigate, or offset such effects. After responding to EFH Conservation Recommendations the lead agency may implement its final decision with consideration of the EFH Conservation Recommendations made by NOAA Fisheries and/or Council(s). 12-FD-i.43 to 12-FD-i.44 – Has NOAA Fisheries Determined the Agency’s Final Decision is Not Consistent with EFH Conservation Recommendations? If the lead agency’s decision is inconsistent with NOAA Fisheries’ or relevant Council’s EFH Conservation Recommendation, then NOAA Fisheries may request a meeting to discuss the action and opportunities for resolving any disagreements. 12-FD-i.45 to 12-FD-i.47 – Has New Information Become Available or has the Lead Agency Revised its Plans in a Manner that May Adversely Affect EFH? The lead agency must reinitiate the EFH Consultation process if the agency substantially revises its plans for an action in a manner that may adversely affect EFH or if new information becomes available that affects the basis for NOAA Fisheries’ EFH Conservation Recommendations. If not, the developer may continue with the project in compliance with applicable EFHA. This page was last modified on 22 February 2019, at 12:48.